At Dursley we pay particular attention to early reading as this is most important. Following the Rose Review, we use the “Letters and Sounds” approach to phonics teaching. In KS1, we use Oxford Reading Tree as our basis for teaching reading at school and supporting reading at home. In the Foundation Stage there are phonetically decodable books known as “Floppy’s Phonics”. There are Software programs to support these in school, purchased via the phonics match funding. The structure of Oxford Reading Tree ensures that children become confident in their grasp of phonics then move on to books which use a range of high frequency words and “tricky” non decodable words. All children have a reading book and reading record book which go home on a daily basis. As children move through KS1 they are able to access books that are appropriate to their reading ability and have age appropriate content. 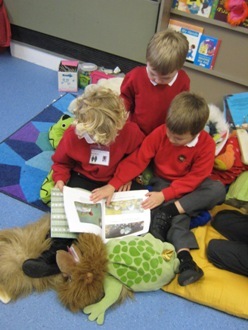 In KS2 books have been graded in several baskets to help children progress and support choice, thus allowing children to choose their own books from a wide selection of fiction available within each classroom. 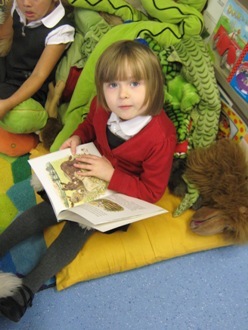 All children have access to the books in our school library. This is is well stocked thanks to the wonderful work of the School Association, who also kindly run it as a lending library on Tuesday and Wednesday night.